Ants are one of the more troublesome pests we deal with in Cairns, with the tropical climate and weather we enjoy, also brings about plenty of ant infestations in homes and businesses. During the warmer months and wet season ants can be quite active in searching out new nest sites and looking for food and water, this is the main reason ants are most commonly found around kitchen sinks, bathrooms, laundries and other wet areas of your home. They are also prone to nesting in any little crack & crevice they may find, making them difficult to treat without the right equipment and products. ​With an estimated 1,000 to 10,000 trillion ant species around the world, they are by far the most common species on the planet. However here in Cairns we generally deal with about 5-10 species invading our properties as a pest. At Pest Off Solutions we use the latest technologies available to eradicate these pests from your homes. Many of the chemical sprays aren't useful in long term ant control so we use several different methods including gel baits, granule baits, granule pesticides and dusting of wall and roof cavities. Here is some brief information on some of the more common ant species in the Cairns area. These little guys are notorious around kitchen/bathroom areas, when allowed time for the colony to multiply they can quickly establish a large presence in your home. Ghost ants are extremely small (approximately 1.5 mm) Their small size and their pale colouring make these ants difficult to see. They nest indoors and outdoors but are opportunistic nesters; in places that sometimes remain viable only for a few days. This ant has the habit of running erratically and rapidly when disturbed. 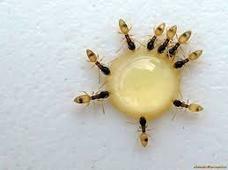 This ant is an avid feeder of anything sweet such as your honey container in your pantry. These ants have a distinctive large headed major worker amongst their ordinary workers in the colony. The majors defend the colony, and perform other tasks such as seed-cracking. It is quite common in Cairns to have the odd phone call from a client suspecting they have termites due to the mess this ant makes around skirting boards etc. They can nest under/behind skirting and carpets, then discard all their waste outside the nest which can frighten a home owner into thinking “What is all this dirt beside my skirting boards”. Generally around 1.5 - 2.5 mm in length, these ants will more often than not also have very busy nests around slab edges and in gardens. Don’t let the name fool you, these guys are glossy black in colour (with white feet under a microscope) This ant is fast becoming a common species in the cairns area, with more and more phone calls about little black ants around bathrooms and kitchens at night. When the colony is large you will see them at all hours of the day but its quite common to only notice them inside at night when starting out. Approximately 2.5 – 3mm in size. Generally will nest outside in gardens and domestic surrounds but once colony is large, will also nest in wall cavities and roof voids. This is a large ant that is most active at night, carpenter ants will nest outside in decaying tree stumps and sometimes in soil. They sometimes nest indoors and will often be found in the hollow of an internal door. Ranging in sizes from 8 – 12mm they are probably best described as looking similar to the local Green weaver ant but brown in colour. ​If you'd like some tips and info on how to help prevent Ant infestations click on the link below. ​Call Pest Off Solutions to rid your house of Ants !